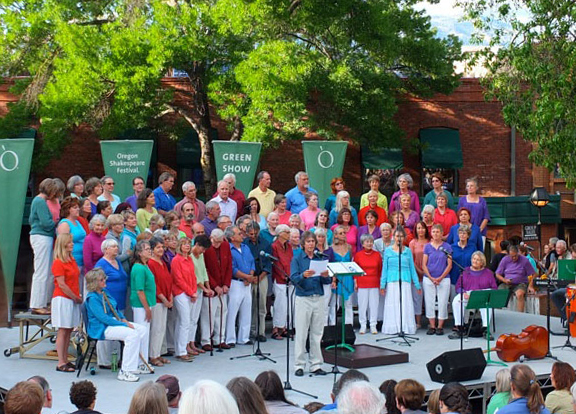 The Rogue Valley Peace Choir is a secular, non-audition choir for all those who can carry a tune. Ability to read music is helpful but not mandatory. Our choir season runs from September to May, with performances throughout the season and occasionally in summer. Weekly rehearsals are held on Thursday evenings from 7 to 9 pm at First United Methodist Church, 175 N. Main St., Ashland. New members are welcomed without audition during September; experienced singers can join the choir thereafter following a successful audition. Dues are $190 (which includes $10 music and recording fee) for the full nine-month season or $30 ($10 fee included) for the first month and $20 a month thereafter. Payments can also be made semi-annually or for each three-month period. Students can join at a reduced rate, and individual accommodations may be available for financial hardship. Interested in helping us change the world, one song at a time? Contact us at Sing@RogueValleyPeaceChoir.org or Director Rob Griswell-Lowry at Director@RogueValleyPeaceChoir.org.